My next project is a baby quilt for my cousin’s first baby. She’s having a girl and is due Feb. 11. I’m so excited to work on a baby quilt! I’ve been working on such big quilts lately that it’s going to be nice to work with one that is relatively small…quick to piece, quick to quilt, and quick to finish. 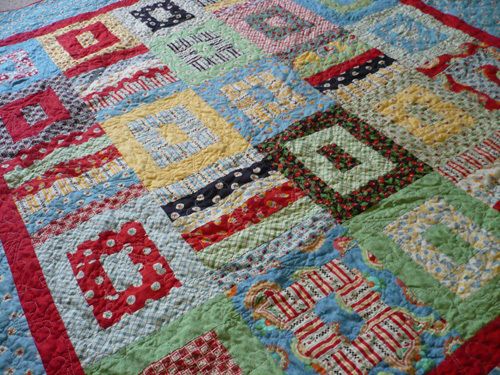 Baby quilts are so satisfying! 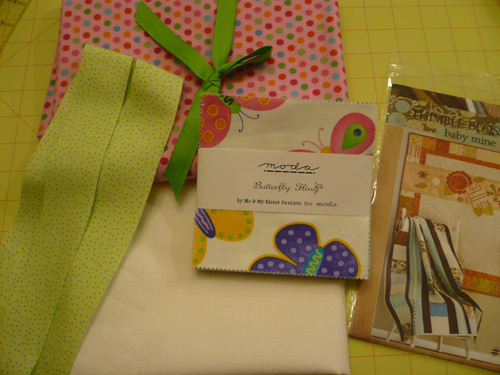 One of my favorite fabric lines is Butterfly Fling by Me & My Sisters Design for Moda. 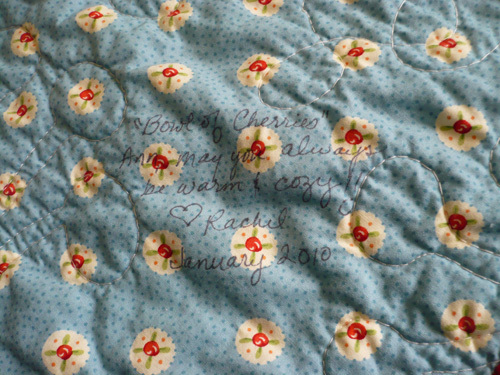 This is the line I made my very first quilt (other than the wall hanging I made in my beginning quilting class). This fabric is so fun and cute and it’s not babyish. The pattern is Baby Mine by Camille Roskelley. This pattern is a great deal because you get 2 patterns…one for a girl quilt and one for a boy quilt. 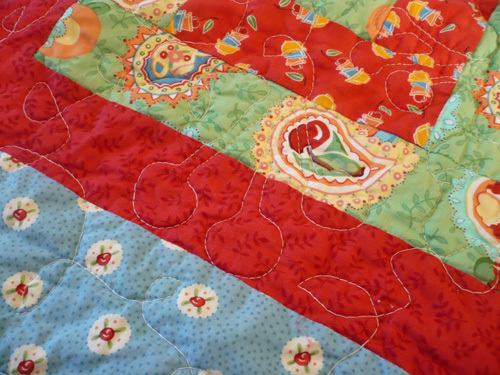 I finally finished quilting and binding the Bowl o f Cherries quilt. 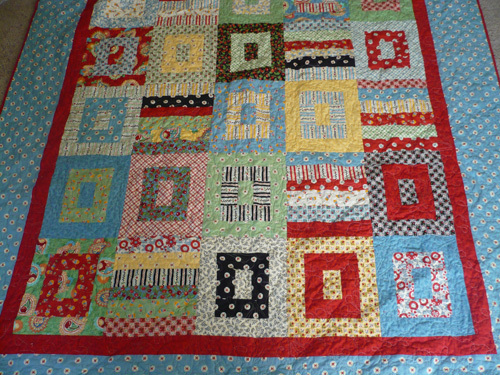 I really do like the way this quilt came out, and I sure hope my Aunt Ann likes it. Instead of using a separate label, I decided to simply write on the back of the quilt. I’m really liking this idea….it’s simple, it’s easy, and it’s permanent. 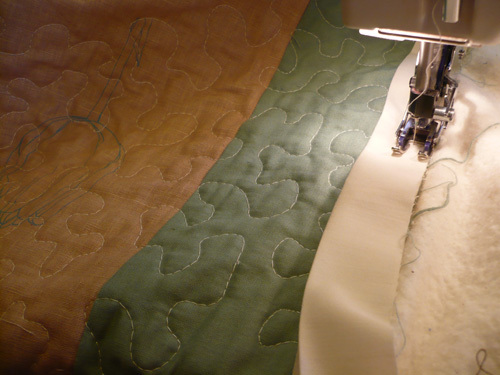 I’ve had the quilting done for the Urban Nature quilt for some time now. The next step was binding. Admittedly I was a nervous to do the binding mostly because at 95 x 95 working on the outer 1/4 inch of the quilt all the way around really made me nervous. Today I decided to take the plunge. And it really wasn’t all that bad. Dare I say no more challenging than the 60 x 70 quilts I’ve done. I’ve noticed lately that if the presser foot pressure is the same as it is when you sew or piece the top when you are trying to sew the binding it creates too much pressure causing the binding fabric to shift in ways you don’t necessary want. (I realize I didn’t explain that well, but I’m not sure how else to explain it). So I decided to experiment with the presser foot pressure, and I found that if I decrease the pressure just a bit the binding sews on beautifully. For example with regular sewing on my machine the presser foot pressure is set to 6. 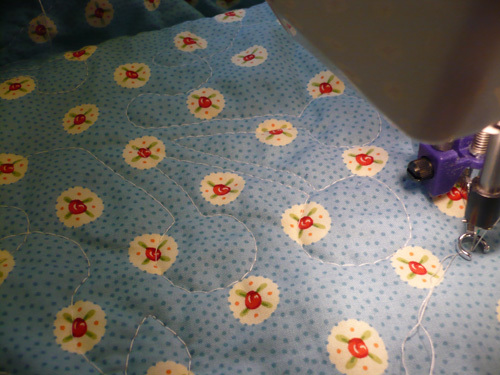 When I free motion quilt I set the presser to 2, and with the binding I set the dial between 4 and 5. Anyway, I’ve never heard of decreasing the presser foot pressure for binding, but for me it made a big difference. I decided to quilt the Bowl of Cherries quilt top with cherries. I thought that would be cute. And it is. But it was way more work than I anticipated. Stippling/meandering is so second nature to me that I really don’t have to think while I’m doing it…my hands just know what to do and it flows smoothly. This was the first time I tried the cherries, and admittedly I probably should’ve tried it on a small quilt first, but I guess because I’m so comfortable with stippling/meandering I didn’t think it would be a big deal. It was so much more time consuming than I thought it would be. I had to really think about what I was doing and where I was going. I’m sure it didn’t help that I was attempting this new technique on a quilt 67 x 74. 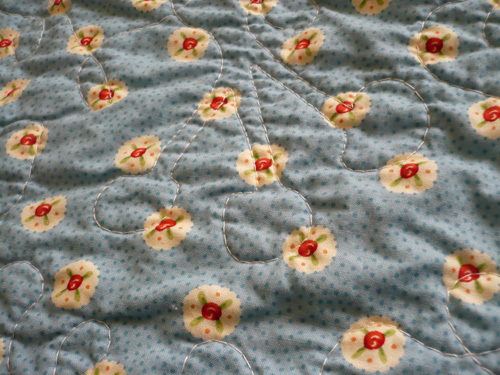 That’s pretty large and challenging to maneuver, and with quilting the cherries, I really needed to be able to move the quilt sandwich around so that the cherries wouldn’t all face the same direction. 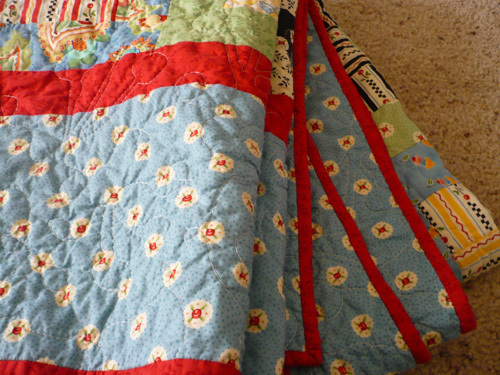 One thing that I’m so glad I did was quilt from the back. The backing (above) was just one fabric and far less busy than the top. I’m glad I thought ahead to do that because with this technique being able to really see where you’ve been and where you’re going is critical (at least for trying a new technique). So, it was a challenge, nonetheless, and I’m finally done—I’m so excited to be done with the quilting. Now on to the binding and hand stitching it to the back.